The south Louisiana neighborhood in which I grew up was shaped like a horseshoe drooping long and oval under the pull of gravity. A street bisected the horseshoe crosswise, as if needing to keep the two sides together, lest they splay outward or implode. If the lowest point of the curved steel was south, my home was east-southeast, just below the intersection of the mainframe and crossbeam. To enter our neighborhood, Bayouwood, you had to go down one of two declines. As you drove deeper in, you approached Contraband Bayou, that winding waterway at the base of the shoe that called many neighbors' yards to an abrupt, beautiful stop. Because you couldn't go anywhere but back out once you were in Bayouwood, there wasn't much traffic, and, by and large, people drove cautiously in residential areas then, so my sister and I could play safely in our driveway and in the streets with the many other kids who lived nearby. Around 4pm on any given afternoon, a distant tinkling would make us all pause. In that sudden stillness we'd realize how sweaty we were, how parched, how whooped in the way good outdoor play makes you. The happy jingle drew nearer, and we all scattered, racing for our mothers' wallets: "The ice cream man is coming, y'all!" flying in our wakes. 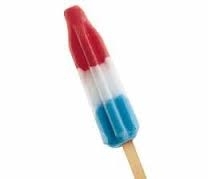 Without fail, I got a Screwball -a plastic cone filled with pink "ice cream" and a gum ball at the bottom- or a Bomb Pop -that long, red, white and blue popsicle- or an orange Push-Up -the paper tube-wrapped orange sorbet that you'd push up with a plastic platform on a stick. I loved each for different reasons. The Push-Up was like an Orange Julius in a handy, mess-free wrapper.What a pleasing color of orange! I always kept the clear plastic pusher after licking it clean. I was enamored with the cleanly delineated lines of the red, white and blue sections of the Bomb Pop. That white was so white, a wonderful counterpoint to the crimson red and wacky royal blue. I could never eat a whole Bomb Pop before it started melting and would then watch as red and blue rivers bled profusely down my hands, wrists and arms before dropping off my elbows, the white areas blurred out by the more assertive colors' quick trip. And the Screwball came with a perfect wooden spoon nestled snugly in the cone's lid. I loved to gently dig it out, and run my fingers over its smooth, hourglass figure before scraping away my first bite of pink. I remember trying to eat the Screwball such that the surface remained flat the whole time. No tunneling or lackadaisical spooning for me, no! I kept things tidy, patient until the frozen gumball was mine. Inevitably, it crumbled, for gumballs really aren't made to live in a deep-freeze on wheels. It was the getting to it that was the fun. This afternoon after school, I took the boys to a favorite playground. The sun was shining, and if we sat in just the right, unshaded place and waited until not a whisper of breeze blew, we felt warmth pervade our bodies. It was heavenly, and when the Good Humor truck rolled by, singing that old, familiar tinkle, I hoped the kids would plead breathlessly for some ice cream. Because I couldn't wait to get them some. "Two chocolate chip cookie sandwiches, please!" Jack asked the man who was hidden deep and faceless in the van's dark interior. "That'll be $6." he replied. Money and ice cream were quickly exchanged, and my two little boys flew off yelling, "Mom, you're the best," as they ran back toward the monkey bars.